By Xah Lee. Date: 2016-03-25 . Last updated: 2018-11-02 . Ok, it's 16 pixels. But what does it mean exactly? is it height of M? or width of M? Neither! What Does Font Size Mean Exactly? The CSS font size of a font is the “em height”. “em height” is the height of a imaginary design box around the font that includes space for ascender and descender plus a little padding. 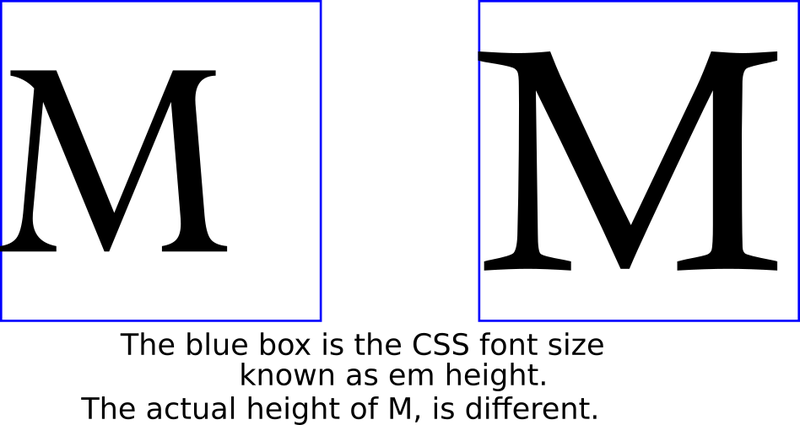 The actual height of letter M, differs depending on the font used. Some character, such as Ü , may extend beyond this design box. Different font with same CSS size spec may be very different CAPTICAL LETTER height, because the ratio of CAPS height to “font size” is not standardized.